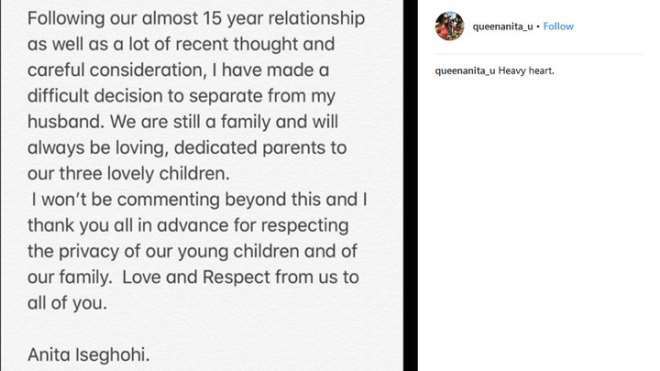 Former Most Beautiful Girl in Nigeria (MBGN) Anita Uwagbale-Iseghohi has just separated from her husband after 15 years of sharing a relationship and 11 years of marriage. The former beauty queen made this revelation in a post she shared via her social media profile early today. The mother of 3 although didn’t state the reason why they are separating, but she maintained that they will still remain as family for the sake of their children. She then went further to state that she will not be accommodating questions and neither will she given any further comments other than this and she will appreciate if the privacy of the family is respected by all.